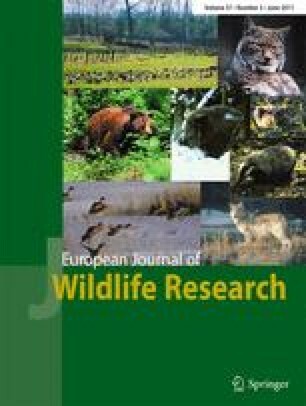 We tested the success, dispersal, and home range of 20 radio-tagged farm-reared red-legged partridges that were released into typical Mediterranean scrubland on a coastal mountain in southern Spain. Partridges were kept in two acclimatization pens separated by 1 km for 4 weeks. Mortality was 25% during the first 10 days, 51.9% at the end of the second month, and stopped by the 14th week after release. The overall survival rate was 20.6%. Mean dispersal distance was 832 m; home range (MPC 95%), 16.6 ha; and activity centers (Kernel 60%), 15.1 ha. Two released females paired with wild males and one of them successfully nested.